The government on Thursday voiced growing concerns about the South Korean economy for the rest of the year, calling for stimulus to respond to the prolonging job crisis here and the escalating US-China trade conflict. The growing level of anxiety came as the central bank nudged down its economic forecast, at last reflecting the pessimistic opinions held by public and private think tanks, while showing little sign of raising the policy rate in the near future. “The employment situation has reached the most critical stage since the 2008 financial crisis,” Deputy Prime Minister and Finance Minister Kim Dong-yeon said in a meeting of economy-related ministers held at Seoul Government Complex. Citing these risk factors, the minister said that the government will come up with additional measures to revitalize the domestic economy and include them in the half-year economic policy directions, which are to be announced within this month. The monthly number of newly created jobs has been lingering slightly above the 100,000 mark for the past five months. The manufacturing sector shed 120,000 jobs last month, declining for three consecutive months. “Sluggish employment is a complex result of a working-age population decrease, shrinking investment and other structural factors, which is why a short-term solution is not plausible,” Kim said, pledging for expansive fiscal operations for this year and next year. He also pointed to a side effect of the Moon Jae-in administration’s initiative to pull up the legal minimum wage up to 10,000 won ($8.90) by 2020. “Some sectors such as retail, food and beverages and lodging businesses, as well as the elderly group aged between 55 and 64, seem to have been affected by the minimum wage (hike),” Kim told reporters after the meeting. 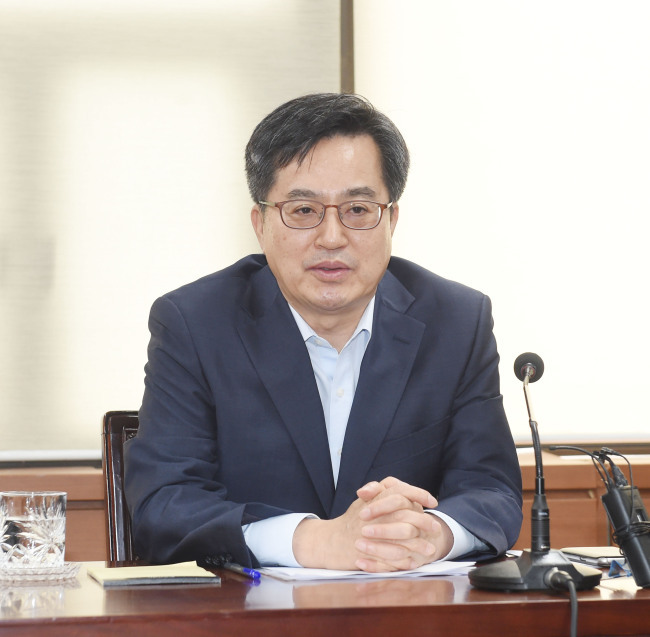 The minister has been seen to stand at odds with Cheong Wa Dae on the pace of the legal wage hike, as he repeatedly alluded to a “flexible approach” in May and June in the face of plummeting employment indexes. While the Ministry of Strategy and Finance focused on the wage-job dynamic, the Ministry of Trade, Industry and Energy grappled with the Washington-Beijing trade war, an external factor likely to affect Seoul’s export-dependent economy. In the absence of Trade Minister Kim Hyun-chong, who on the previous day left for Washington to meet with US Trade Representative Office counterparts, Deputy Trade Minister Kang Sung-chun chaired a meeting with related ministries, public organizations and businesses. Saying the US-China trade dispute was “likely to be prolonged,” he urged related ministries to closely monitor and respond to the issue in order to stop external uncertainties from spreading to the economy here. 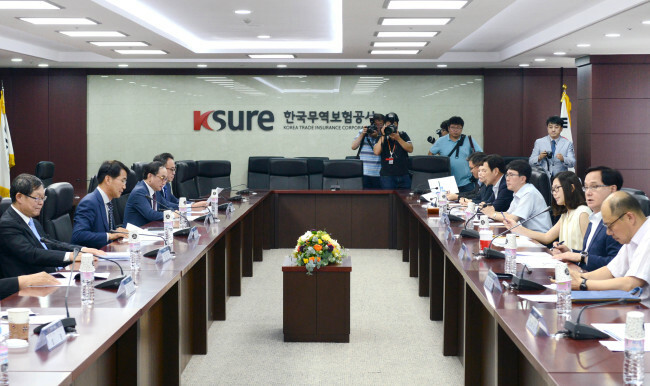 With the ongoing trade war, Korea will need to make a fundamental change by diversifying its export markets, fostering high-valued export products and expanding service exports, according to the deputy minister. The government’s defensive gestures came as the central bank sent warning signals on the nation’s economy during the upcoming years. After freezing the nation’s policy rate at 1.5 percent for eight consecutive months, the Bank of Korea revised down the economic forecast for this year to 2.9 percent, down 0.1 percentage point from its previously suggested 3 percent. The corresponding figure for next year was also inched down from 2.9 percent to 2.8 percent. “Though our economy is expected to keep up a growth pace, it is true that uncertainty is higher than ever,” said BOK Gov. Lee Ju-yeol, referring to the US-China trade conflict. The monetary policy chief also denied speculations that the central bank is considering a rate hike for as early as next month. “One of the Monetary Policy Board members held a minority opinion (for a rate hike), but this should not be interpreted as an official hike signal of the board,” Lee added. Despite mounting pressure to increase the nation’s key rate in step with the money-tightening gesture in leading countries, Seoul’s central bank has been refraining from similar moves due to the slower-than-expected economic recovery and the record amount of household debt here.